My evening began with the final Marlins game of the year against the Nats. It was the end of an era, really. The Florida Marlins are technically no more (they’re officially no more on 11 November) and I wish they closed out Joe Robbie Stadium with a bang, but instead they went out with a whimper. That happens when you face Stephen Strasburg, I guess. Still, listening to Mike Lowell reminisce about the old team and ballpark and just seeing it all finally come to an end is kind of heartbreaking. I hope that the new name reinvigorates Miami like it did for Tampa. I also really hope the “leaked logos” are not the official logos. We’ll see come November. In bigger news, the Tampa Bay Rays locked a playoff spot in dramatic fashion. They scarily fell behind the Yankees 7-0 thanks to a grand slam by Teixeira and countless other home runs and they didn’t really make a dent until the 8th. Then things started to happen. The bases loaded. Walk. 7-1. Hit by pitch. 7-2. Sacrifice fly. 7-3. THREE RUN HOME RUN BY LONGORIA! 7-6! Finally it was bottom of the 9th. Two outs. Two strikes. Dan Johnson steps up and recreates the 2008 magic. Home run barely over the right field fence! Tie game! Nothing much happens until the 12th. Minutes before his at-bat, the Red Sox manage to lose their rain delayed game to the Orioles in walk-off fashion. 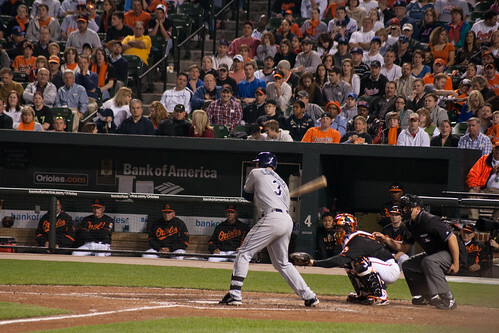 Longoria comes up to the plate. Works the count to 2-2. Fouls off a pitch…HOME RUN BARELY CLEARS THE LEFT FIELD WALL! The Rays are going to the playoffs! It was a wild night with an added bonus: the Braves managed to blow their game too and were eliminated from the playoffs. What. A. Night. This is actually dangerous. Pies to the face are not. 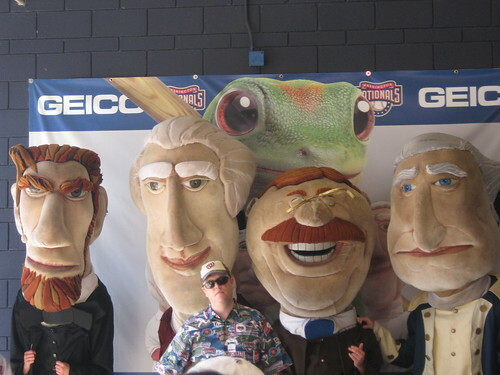 So last night I went to Nationals Park explicitly to see Strasburg face off against Heyward and the Braves. Mere minutes before his start, they announce that Miguel Batista will make the start instead. This is as thousands of fans were still flowing into the park being duped into thinking the tickets they were buying were still for Strasburg. In this case, it wasn’t a injury whose genesis was stupid, just shoulder inflammation that Strasburg also battled when he pitched for San Diego State, but it was still a huge bummer. An actual stupid injury came to my favorite Marlins player, Chris Coghlan, when he was celebrating a walk-off hit by Wes Helms. Cogz landed badly on his leg after jumping to shaving cream pie Helms in the face and managed a meniscus tear in his knee. We’re going to end up losing him 6-8 weeks and he may need surgery. Coghlan is a fantastic player and a key part of the Marlins team and this stupid freak accident caused us to lose him. It’s really frustrating. We’ve hit the point of the season where teams are starting to know whether or not they’re gonna make it. Teams like the Marlins, Nationals, and Mariners have to realize by now that the playoffs aren’t in their futures, but other teams, like the Rangers and Padres are realizing that they’re in this thing. – Texas has taken on Cliff Lee. – The Padres will not trade Adrian Gonzalez. I realistically expect the Rays to either take the AL East or get in via the Wild Card. Beyond that, I think the Braves and Yankees are locks for the postseason, but those are the only three whose futures I feel good about predicting. I’ll need to do a mid-season report soon, so expect that next week-ish. It's from the Baltimore series, but there was no way I could make it to Puerto Rico for this one. Leo Nuñez likes giving everyone near heart attacks. He blew the save last night, but Florida still managed a win thanks to Dan Uggla. Yomiuri Giants (12) at Hiroshima Carp (9). Six Giants homered (Ramirez homered three times) to put the Giants way ahead of Hiroshima who managed quite an offense themselves. An ugly game that puts them at 27-40-2. At this rate Yakult might pass them. Rakuten Eagles (0) at Orix Buffaloes (3). Few teams play more erratically than the Orix Buffaloes, but they’re doing consistently well against the Eagles this year. Tanaka’s Tuesday role is not doing the Eagles any favors as he gives up three over eight and the team moves to 32-38-2, good for last in the PL. 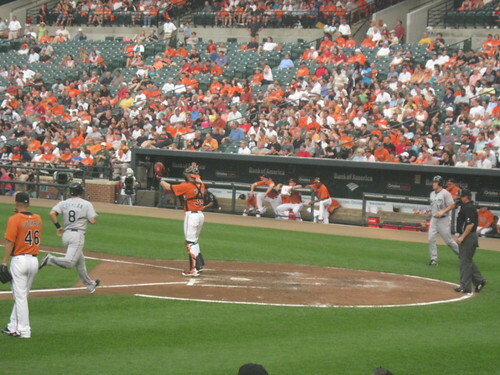 Oakland Athletics (4) at Baltimore Orioles (2). A pretty solid start for Brian Matusz, but it just wasn’t enough to keep the Athletics at bay. I’m a little bitter that I’ll be missing Matt Wieters bobblehead night today, so that’s all I’ve got for Baltimore. They are 23-53. New York Mets (6) at Florida Marlins (7). The Marlins were lucky to win this one in the ninth thanks to a walk-off single by Dan Uggla. The game also featured a Hanley Ramirez grand slam, but far fewer homers than the night before. Florida remains in fourth, but now holds a 37-40 record. Tampa Bay Rays (5) at Boston Red Sox (8). The pitching just wasn’t there for Jamie Shields who gave up a few too many to an ailing Boston team. Tampa needs to take two out of three in this series to regain second and the wild card. The Rays now sit at 44-32 in third. Washington Nationals (7) at Atlanta Braves (2). The Nats do everyone in the East a favor by knocking down the Braves and winning their first in ages. It’s a good thing, because Washington starters whose names don’t contain Strasburg have been seriously struggling of late. Their last place record improves to 34-44. He's kind of a big kid. The Marlins went down to Puerto Rico to play a series against the Mets and build baseball interest in the Caribbean. Almost everyone else took the day off. New York Mets (3) at Florida Marlins (10). The Fish got some serious offense going last night. Mike Stanton hit his second major league home run, a 3-run blast, and Nolasco had himself a quality start for the first time in a while. The Mets scored all three runs on two Jason Bay home runs, but couldn’t do much else against the Marlins. Florida’s record improves to 36-40. Manager news might come at the end of the week. Washington Nationals (0) at Atlanta Braves (5). On a night where Washington needed to knock the Braves down a peg or two, there’s no better pitcher to rely on than Stephen Strasburg, except he had what may have been his worst start of the season with absolutely zero run support. It’s funny, of course, when you consider a regular quality start the worst start of his career, but Stephen went 6.1, gave up 4 runs (3 earned thanks to Desmond’s league leading errors), two walks, with seven strikeouts. He can have off-days like this if his team scores him runs, but the sleeping offense led to their current 33-44 record. I’m hoping they pick it up, because Braves losses can only be good for the rest of the NL East. A lot of this happened last night. Florida inexplicably went and replaced their manager, Fredi Gonzalez, yesterday and Edwin Rodriguez stepped in as interim manager. I still don’t understand why this happened, but I guess we’ll have a new manager next year. Hanshin Tigers (9) at Hiroshima Carp (4). I was really hoping that Hiroshima would have a better showing coming off of some relatively solid interleague play. He’s on the wrong team, but Toritani had himself quite the night (4 H, 2 RBI). Go Toritani! The Carp record drops to 26-37-2, still in fourth. Saitama Seibu Lions (8) at Rakuten Eagles (10). Remember when Rakuten had no offense to speak of? They’re lucky to have won this considering that Darrell Rasner only went 3.2 innings and gave up five. The Golden Eagles are now 31-35-1 and they’re closing in on fourth. Kansas City Royals (1) at Washington Nationals (0). I hope Strasburg doesn’t end up one of those pitchers who never gets any run support from his team. Washington has been seriously struggling offensively of late, so I’m not too surprised, but it’s a waste of a quality start. Strasburg K-Kount (see what I did there?) is up to 41. The Nationals record is down to 33-40. 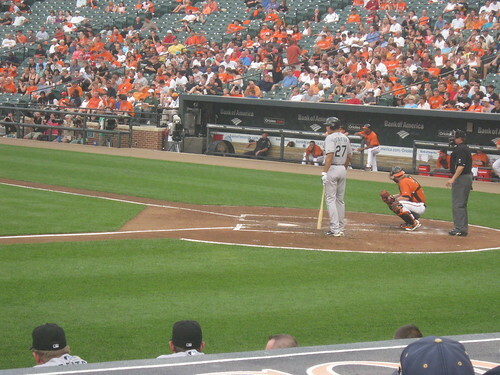 Florida Marlins (7) at Baltimore Orioles (5). Even though their winningest manager in franchise history was fired, the Marlins were still able to show up, offensively, and dominate the birds. Gaby Sanchez has been quietly making a case for Rookie of the Year with his offense while Chris Coghlan is definitely back to his old self, hitting 0.317 since his season low of 0.146 in April. That’s good enough to put his average at 0.280 now. The Marlins record improves to 35-36 while Baltimore drops to 19-52. San Diego Padres (5) at Tampa Bay Rays (4). So frustrating. They’re still tied for second, but Shields’ loss to San Diego extends their losing streak to three. Maddon needs to sit down with his players, hash this out, and get them back on course, pronto. The Rays are now 42-29 on the season. 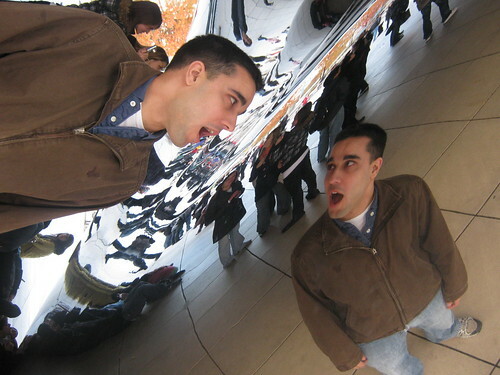 I wasn't at the Bean, but it's also in Chicago. My photos aren't uploaded yet. 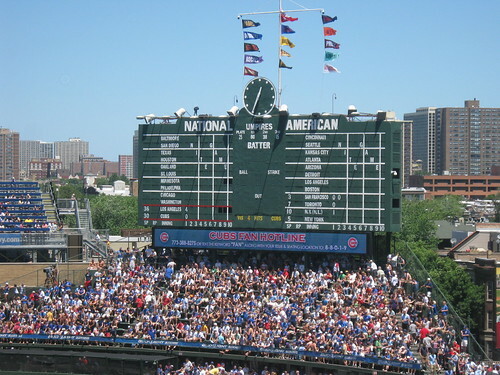 Lots of action this weekend, including a game I attended in the Friendly Confines that will not be mentioned because I don’t cover the Cubs or the Angels. Yakult Swallows at Hiroshima Carp. Rain delayed. Rakuten Eagles at Chiba Lotte Marines. Rain delayed. Chicago White Sox (2) at Washington Nationals (1). 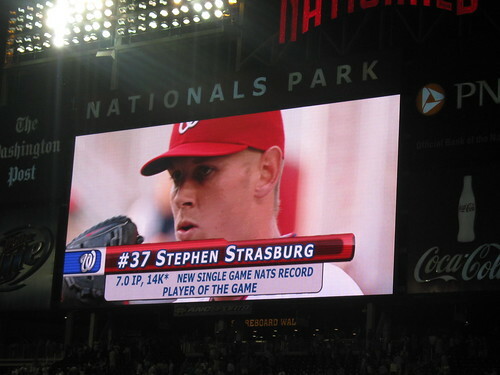 Strasburg went out for his second home outing and pitched another stellar game, allowing only one over seven innings and striking out another 10. This kid is insane. The game is lost on a bad throw in the 11th, and Strasburg gets his first no decision. 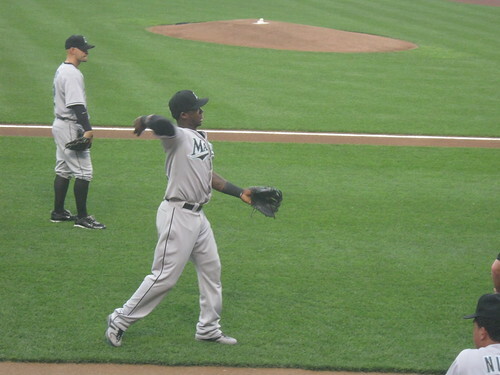 Tampa Bay Rays (4) at Florida Marlins (7). I turn off my Rays switch again to root for another great Marlins game. I’m super bummed I missed it, but this game had Mike Stanton’s first home run and boy was it a doozy. First homers don’t get any better than grand slams. Baltimore Orioles (2) at San Diego Padres (3). The Padres are the biggest surprise this year. The Orioles, not so much. Swallows (1) at Carp (5). The Carp have to wait a day to kick off non-interleague play, but they come out with a bang. It’s no surprise Yakult’s score is so low, it was a Kenta Maeda start. That guy is a monster. Eagles (3) at Marines (0). Iwakuma returns to form against the PL as he blanks the hard-hitting Marines. White Sox (1) at Nationals (0). Jake Peavy throws an incredible game and the Nats just keep on losing and sliding down. Rays (9) at Marlins (8). A wild game that went into extras was blown by Jorge Sosa walking in two in the 11th. The Marlins came within one, but couldn’t tack that final one down. Orioles (5) at Padres (4). Stop the presses, Kevin Milwood FINALLY got his first win of the season. Congrats, buddy, you didn’t deserve to go this long without one. Eagles (1) at Marines (3). Rakuten went through with its plan to separate Tanaka and Iwakuma, but that means they won’t be winning back-to-back almost every Saturday and Sunday. Rakuten closes the weekend in fifth with a 30-34-1 record. Rays (1) at Marlins (4). Price vs. Johnson was one of the best matchups of the weekend, but David was no match for the Fish while the Rays struggled against the Marlins ace. Way to go Florida, you’re now 33-36 in fourth while Tampa drops to 42-27, tied with Boston for second. White Sox (6) at Nationals (3). The losing streak continues. It’s starting to get really ugly in Washington again. They are now 31-39 in last. Do they have any other rookie phenoms to call up? Orioles (4) at Padres (9). 19-50. Yikes. Enough said.